Bloom’s & SOLO ‘are not Just Colorful Posters we Hang on the Wall’ is my two-part series at Education Week Teacher. I personally try to use Bloom’s Taxonomy in two ways. One, I have a big wall chart in the front of my classroom with a summary of each level of the Taxonomy and “question starters” for each of them. Since I spend a lot of time helping my students practice reading strategies, and one of them is asking questions, they can take advantage of the accessibility of this poster. After reviewing what the whole thing means, we discuss how — by practicing asking themselves the higher-level questions while they read a text — they can gain a deeper understand of its meaning. In addition, I try to use Bloom’s to help me formulate my own lessons. In order to do that, I just need simple, accessible, and practical reminders that I can use. That’s what you’ll primarily find on this list. Here’s a Bloom’s Taxonomy chart that’s organized very simply, with many question-starters, and that I can keep on my desk or with my papers to help me remember the levels, questions, and practical activities that could go with them. This short article has an even smaller Verb Chart that can serve as a reminder when planning lessons. Educational Origami has a wiki that is THE place to get ideas on how to relate technology to Bloom’s. Here’s an interesting Bloom’s Activity Analysis Tool. The New Jersey World Languages Curriculum Framework is a PDF document with a lot of interesting stuff. The most interesting item in it — by far — is a Bloom’s Taxonomy framework for language learners. It’s Figure 47. It lays-out teaching and learning strategies — specifically for language learners — for each level of the taxonomy. Harry Tuttle has come-up with an intriguing way to evaluate student projects using Web 2.0 application. I’d encourage you to read his post (and the comments section where he answers a question I left for him). He basically assigns each level of Bloom’s Taxonomy a number — the higher the level, the higher the number. He identifies the level the student achieved in his/her project, and then multiplies it by the number of days they worked on it. It seems to me that this could be a useful formula. The Differentiator is a cool online application designed to use Bloom’s Taxonomy and other similar thinking/planning “charts” to come-up with appropriate high-level student assignments (I’m sorry, I couldn’t think of any better way to describe it). Though I’m not that sure if it brings much more value than other sites on this list, it still belongs here just because it’s a cool-looking tool. Check it out and you’ll understand what I mean. Developing Questions For Critical Thinking is an interactive site using a revised version of Bloom’s Taxonomy that was developing in the 1990’s. It seems like it has some very useful resources. Educational Origami has created Six Quick Sheets For Bloom’s Digital Taxonomy. I’ve just read an excellent post by George Couros titled Bloom’s Taxonomy and a Pen, which uses a pen as an analogy for explaining the different Taxonomy levels. It’s an excellent idea, and I’m kicking myself for not thinking of using an analogy before when we teach the Taxonomy in our ninth-grade English classes. This page has good info on Bloom’s Taxonomy, especially a nice animation you can see if you scroll down a little bit. The ASCD In Service blog has republished two twenty-five year old interviews with Benjamin Bloom, creator of Bloom’s Taxonomy. They’re not specifically related to the Taxonomy, but they focus on two other very interesting topics — automaticity and talent development. Even thought they’re aren’t on the Taxonomy, I still think they’re worth being on this list. Joshua Coupal has created a very useful slideshow on the changes in Bloom’s Taxonomy and how it can be applied through digital tools. He used Prezi, and I know it looks cool and everything, but just have to say that I find Prezi distracting and disorienting. But, perhaps I’m just an old fuddy duddy. Developing Thinking Skills Through Higher-Level Questioning is an online presentation from the Ontario Ministry of Education. 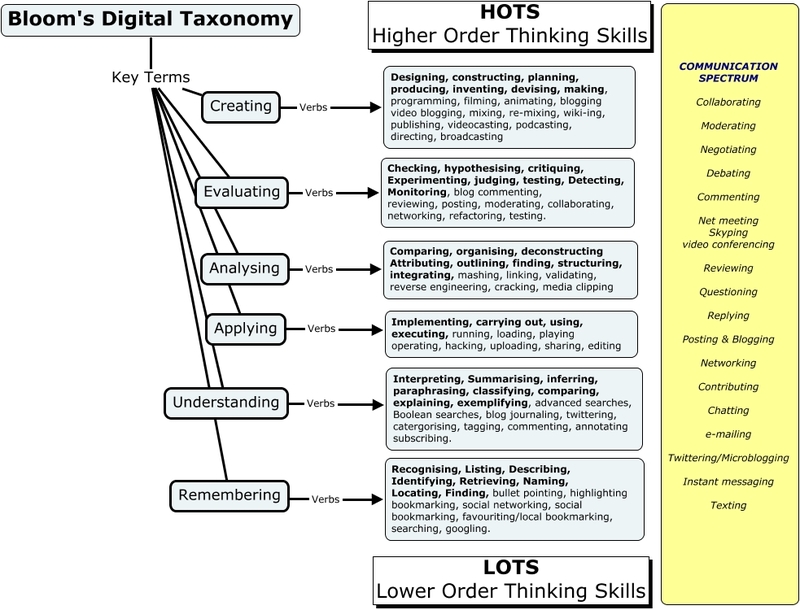 Here’s a nice new (to me, at least) Bloom’s Digital Taxonomy — slightly different from the one that most are familiar with. A picture is worth a thousand thoughts: inquiry with Bloom’s taxonomy is the title of a very useful resource from Learn NC. It shows a photo, along with the original Bloom’s Taxonomy pyramid. By clicking on each thinking level, you are shown questions about the photo reflecting the level. It’s a very simple and visual way to teach Bloom’s Taxonomy, and can easily be replicated as a student assignment in any classroom. I like this interactive A LOT. Bloomin’ Mathematics is a great post sharing ways to incorporate Bloom’s Taxonomy into teaching math. Teaching with the Revised Bloom’s Taxonomy from Northern Illinois University has some very nice hand-outs. Why Is It Important For Students To Learn About Bloom’s Taxonomy? BloomsApps is an intriguing, regularly changing collection of iPhone applications correlated to each level of Bloom’s Taxonomy. Thanks to Andrew P. Marcinek for the tip. I’ve previously posted about the Bloom’s Taxonomy of Reflection that Peter Pappas developed. I just discovered that he developed this excellent Prezi about it. I’d also strongly encourage you to read his post that explains it further, as well as one by Langwitches giving an example of how to apply it in the classroom. K-5 iPad Apps to Evaluate Creating: Part Six of Bloom’s Revised Taxonomy is a series of useful posts at Edutopia. Bloom’s Taxonomy and iPad Apps is a useful post from Langwitches. Bloom’s Digital Taxonomy Wheel is a very cool interactive, but it also seems a bit strange to me. I’m just not sure how helpful people will find it. Kathy Schrock has put all her “Bloomin’ Apps” collection in one place. Here’s a fun video using Seinfield to illustrate the levels of Bloom’s Taxonomy. I don’t necessarily think it’s as good as the Star Wars or Pirates of the Caribbean videos already on this list, but it’s fun. I can’t embed it here because that ability was disabled. Bloom’s taxonomy and English language learners is by Judie Haynes. Flipping Bloom’s Taxonomy is from Powerful Learning Practice. Do students need to learn lower-level factual and procedural knowledge before they can do higher-order thinking? is from Scott McLeod. If Math Is Basketball, Let Students Play The Game is by Dan Meyer, and is just a very thoughtful commentary on teaching and applicable to all subjects. His comments can be applied to some recent additions I’ve made to this list questioning whether students have to start at lower levels of thinking in order to “build-up” to the higher ones, so I’m adding it here. In my book, Helping Students Motivate Themselves, I include an extensive and engaging lesson plan on Bloom’s Taxonomy. There and in this “The Best” list, I also include discussions of the dangers of viewing it as a rigid pyramid that must be climbed rung-by-rung. A new addition to that lesson plan, which I hadn’t gotten around to sharing here previously but which has worked well with students, is to show them different illustrations of Bloom’s Taxonomy and have them determine which they think is best and why (and to also give them the option of creating their own). I do this near the end of the lesson after they’re familiar with the different levels and the interplay between them. I found this nice and simple Bloom’s Taxonomy Poster on Pinterest via Carla Arena. I believe, though I’m not sure, that teacher Jennifer Jones created it. She seems to have a number of useful materials on her site, so I’d encourage you to check it out. 22 Ways To Use Twitter With Bloom’s Taxonomy is from teachbytes. “Are Harder Questions Better Than Easier Questions?” – A New Activity. 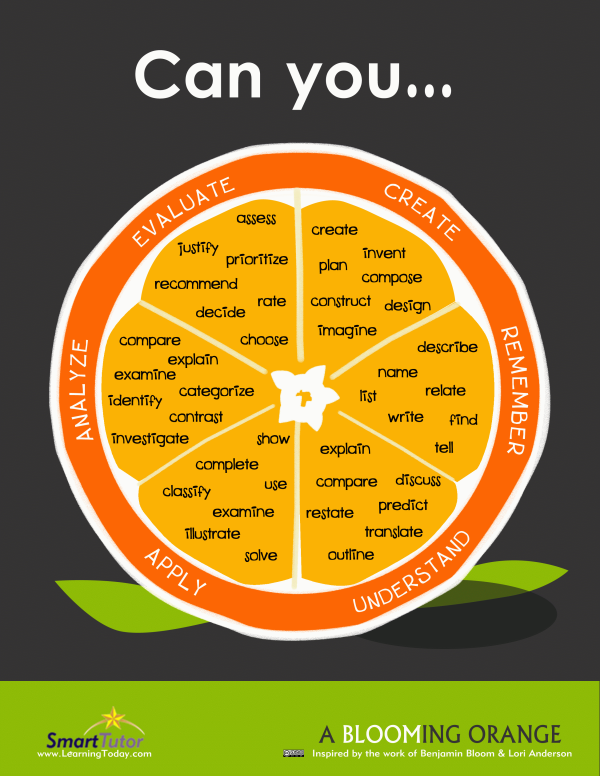 14 Brilliant Bloom’s Taxonomy Posters For Teachers is from Teach Thought. 25 Ways To Use Pinterest With Bloom’s Taxonomy is a useful chart from TeachBytes. 44 Prompts Merging Reflective Thinking With Bloom’s Taxonomy is by Peter Pappas. In yet another example of how much I do not know, I’ve recently learned about the Structure of the Observed Learning Outcome (SOLO), which can be characterized as an alternative to Bloom’s Taxonomy. I read about it at Peter DeWitt’s fine Education blog in his post, What’s Our Best Taxonomy? Bloom’s or SOLO? Here’s a Prezi on it: And here’s a link to an intriguing visual representation of it. Scott McLeod just sent out a tweet about a forty page PDF document titled “Bloom’s Taxonomy: What’s Old Is New Again.” It’s written by Cecelia Munzenmaier, MS, with Nancy Rubin, PhD. I’ve got a lot of resources on this list, but this document provides the best overview and must up-to-date history — and how to implement it in the classroom, that I’ve seen anywhere. Incorporating Bloom’s Taxonomy into your lesson objectives is by Adam Simpson. In this post, I include videos using Star Wars, Finding Nemo, Pirates of the Caribbean, and other movies to teach Bloom’s. Here’s another such video, and this one uses scenes from Harry Potter. Unfortunately, it has embedding disabled, so you’ll have to go to the link on YouTube. 18 Ways To Use YouTube With Bloom’s Taxonomy is from TeachBytes. 5 unfortunate misunderstandings that almost all educators have about Bloom’s Taxonomy. is by Grant Wiggins. A Crash Course in Teaching with Apps That Align to Bloom’s Taxonomy is a BAM! episode hosted by Vicki Davis. 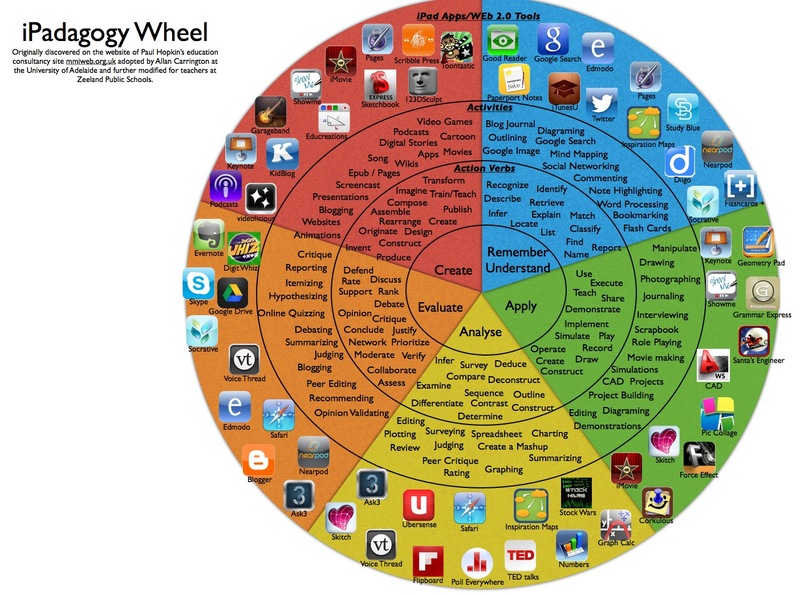 Blooms Taxonomy of Apps for iOS is from eLearning blog. Bloom’s Taxonomy Circle Diagram is a nice interactive. (Not) Blooms. is from The Agility Teaching Toolkit, and offers a unique perspective on explaining Bloom’s Taxonomy to students. The Intersection of UDL and Bloom’s Taxonomy is a useful article by Elizabeth Stein at Middleweb. The great Mia MacMeekin has created a Spanish version of her popular Bloom’s Taxonomy infographic (you can find the English version above). You can also see a bigger version at her site. EFL Classrooms Can Teach Higher Order Thinking Skills is an article from Humanising Language Teaching. To what extent does Bloom’s taxonomy actually apply to foreign language teaching and learning? is from The Language Gym. Applying Bloom’s Taxonomy with Newsela is from…Newsela. Awesome and very useful graphic on SOLO taxonomy. 26 Critical Thinking Tools Aligned With Bloom’s Taxonomy is from Global Digital Citizen. 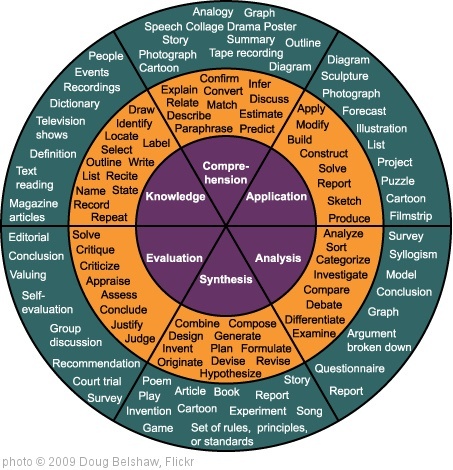 Sharing the Depth of Knowledge Wheel With Students is from Edutopia. There’s been a recent flurry of activity by some to redesign Bloom’s Taxonomy by questioning whether “knowledge” should be at the bottom. Personally, I interpret knowledge being at the bottom not saying students shouldn’t prioritize learning and educators teaching it but, instead, suggesting that application of knowledge is harder to teach and learn. That, I think, is the key value in the taxonomy – reminding us to put effort into areas of learning that it is easy for teachers to avoid. BLOOM’S TAXONOMY—THAT PYRAMID IS A PROBLEM is by Doug Lemov. LA TAXONOMÍA DE BLOOM Y SUS ACTUALIZACIONES is a useful resource on Bloom’s Taxonomy in Spanish. Shifting from Bloom as ladder to Bloom as web is particularly critical if the goal is to re-engage learners for whom school is not working well. Here’s What’s Wrong With Bloom’s Taxonomy: A Deeper Learning Perspective is by Ron Berger. Bloom’s Taxonomy in the Classroom is from The Utah Education Network. We Learn by Doing: What Educators Get Wrong About Bloom’s Taxonomy is by Ron Berger. Higher Order Thinking Skills (HOTS) is from the British Council. Retrieval Practice & Bloom’s Taxonomy: Do Students Need Fact Knowledge Before Higher Order Learning? is from Pooja K. Agarwal. I’d like to see you describe the lessons you do, as I think that would help “paint pcitures” for all of us. I’m thinking about this a lot in my blog, too, and am in the process of describing several lessons now. (Reflections of the TZST Teacher @http://tzstchr.edublogs.org) You also might want to join the conversation at http://bloomsrubrics.wikispaces.com/ and add this link. Thanks for sharing the resources–getting the taxonomy in front of teachers in mindful ways is a great start. Conversations help move us along the continuum of use as well. The way to reach students is to understand how they think, and build from there. We have to stress basic principles. See “Teaching and Helping Students Think and Do Better” on amazon. Tremendously helpful post. This is something like the pyramids. I know it existed a long time ago, and I forget and rediscover it from time to time. The rediscovery always stimulates a great boost of mental activity. Great post. So often we teach/train to a much lower level of learning that is necessary for people to be successful. I teach trainers for the corporate environment and emphasize that we need to teach people to do, think and create, rather than learn by rote. Here’s a link to some resources created by teachers in Australia – activity charts that combine Bloom’s Taxonomy with Multiple Intelligences…Great stuff! As a student in a concurrent education program I am definitely familiar and frustrated with jargon…. It is very overwhelming to have so much literature, but no idea how to apply it. The art of questioning has been a major topic in our classroom discussions as related to Bloom’s taxonomy. I really admire that fact that you are having your students take ownership of their learning by having them work with this taxonomy (as opposed to being strictly used by the teacher). Thank you so much for sharing these resources! Although you posted this two years ago, it is JUST what I was looking for. I find your blog very informative and I have just subscribed, since you have an ELL point of view. i am very thankful for i have found this site… it helped me a lot in understanding the concepts of the bloom’s taxonomy of objectives… i just hope that you will expand and give a clearer explanations on the revised taxonomies of knowledge : re, factual , conceptual, procedural, and metacognitive; for this is what we are using in our school and many of us find difficulty in plotting our table of specification… GODBLESS and MORE POWER! I am a teacher trainer and use Bloom’s taxonomy extensively. After having seen several websites in the last couple of years, I found some totally new resources on this site. I was looking for some material to teach this taxonomy to students in a college – to encourage them for higher order thinking. Thanks a lot. Thank you for your great resources! I really like your site and listing of all the Bloom resources. I am an education student seeking out good resources and finding so many all in one place is awesome. The link for http://www.celt.iastate.edu/teaching/RevisedBlooms1.html seems to be broken. thanks so much for your useful pieces of information in Bloom taxonomy. 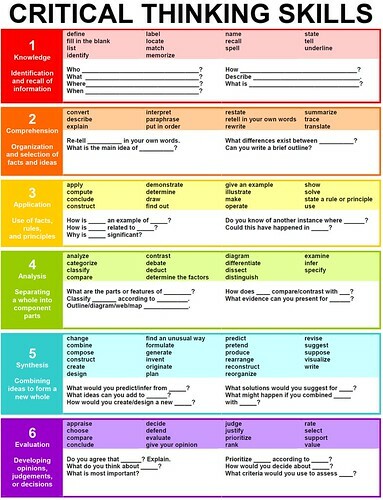 I am going to write a Ph.D thesis on Bloom taxonomy. I would be grateful if you could give me more information if in need. Try Andrew Churche’s Educational Origami Wiki. This is such a great list, but it a shame that many of the links are no longer. If it could be updated or revised that would be great. Let me know if this sounds like something you might like on your site. Can at college/ university assessment of certificate, diploma and degree courses have separate tests for each of the 6 of bloom’s. Thanks and God Bless.